10 % of 224 = ? Method is same as for the above, just instead of one digit move the decimal point towards left by two digit. First find 10% of the number (moving decimal point) and divide it by 2 or First divide the number by two then take 10% of it. Find 10% of the number plus 5% of the number or half of the 10%. Just divide the number by 2 to find the 50% of the number. 50% of 224 = ? To find 25% of a number, take half of 50% of the number or alternatively you can divide the number by 2. 25% of 224 = ? Find out 25% of the number and then subtract it from the given number or alternatively we can say, take 100% of the number ( which is the number itself) and 25% of the number and subtract these two result. Add 50% of the number to 10% of the number. Similarly you can find out 40% of a number by doing 50% minus 10% of the number. To find 85% of a number, subtract 15% of the number from the given number or alternatively wee can say subtract 15% of the number from the 100% of the number. 85% of 224 = ? As we have become familiar within the methods, now let's check few more which are on the next level. III. Then add 1 % of the number. 41% of 224 = ? Now, have you some idea how to find 97% of a number? Yeah, you can subtract 3% of the number from the given number. 3% can be calculated by multiplying 1% of the number by 3. Do it yourself. 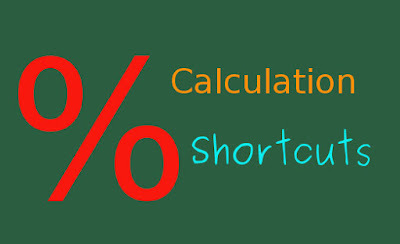 Do you have some more tricks to find out percentage of a number? Let us know. If you have any difficulties or you have found any mistakes in this article, please inform us below in the comment section. See you in the next article with some more shortcut methods. I liked the information shared by you. share your views on rrb level 1 admit card dates.